I first came across lamingtons in some old cookery cards that my mother picked up at a jumble sale, way, way back in the mists of time (circa late 80s, ahem). They were dipped in red jam, perhaps strawberry or raspberry, and rolled in desiccated coconut. I thought that they looked – let’s not mince words here – disgusting. The recipe informed me that lamingtons were an Australian delicacy; that was fine. Australia was, as far as I was concerned, a million miles away. I didn’t realise that Australia and Australians, and the general antipodean region, were to make quite such an impact on my life. 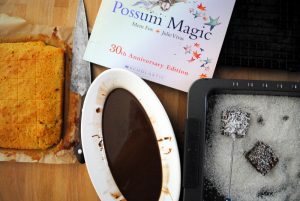 Now, as well as living with a Kiwi, there’s a semi-resident Aussie who comes to stay – and be fed – every week. When I first made these lamingtons, for a feature on baking inspired by children’s books in the Irish Examiner, they went down a treat. “Strewth!” said the Aussie, much to the half-Kiwi kids’ amusement. 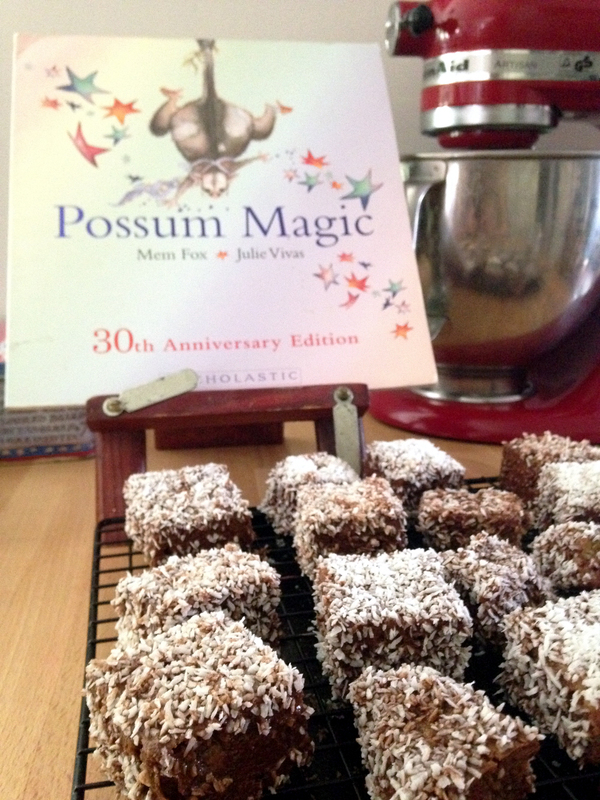 I might just have to whip up another batch for Australia Day. Just in the interest of peaceful Australia-New Zealand relations, you understand. Normally these are made with a lighter sponge cake but I prefer this variation as they’re less likely to fall apart when you’re doing the chocolate dipping and coconut rolling, especially when you have small hands helping. Makes 20. Sift the flour and baking powder together. Set aside. Using an electric whisk, cream the butter and sugar together in a large bowl until pale and airy. Add the eggs, one at a time, mixing well between each addition. Stir in the dry ingredients. Place the mixture into the prepared tin and smooth the top. Bake in the preheated oven for 25-30 minutes, or until a cake tester comes out clean. Turn out onto a wire tray and cool. Cut into 20 squares. In a bowl over simmering water or the microwave, melt the dark chocolate and oil together. Add the salt and mix until smooth. Spread the coconut on a plate. Using a fork or skewer, dip the cake squares into the liquid chocolate and then roll in coconut. This may involve a certain level of small people stickiness. Devour with a well-earned cup of tea.